Come home to the finest living in Scottsdale, Arizona at Camden San Marcos. Our community has multiple one, two and three bedroom apartment floor plans available for you to choose from. We even offer a unique, stand-alone, one level casita option. Camden San Marcos offers spacious open-concept apartments featuring granite countertops, chocolate-finished cabinets, nickel hardware and LED lighting. Each home also includes a washer/dryer, large walk-in closets and private patios. Camden San Marcos also offers assigned parking spaces with visitor parking available. Take a virtual tour of the community to see it for yourself! Entertain your neighbors and friends from the comforts of your own home at our resort-style swimming pool and gas BBQ grills. Camden San Marcos is a pet-friendly apartment community with a fenced, private dog park, as well as several pet clean-up stations throughout the community. You can finally drop that costly gym membership when you visit our 24-hour fitness center with cardio equipment, free weights and more. Start planning your new workout routines - check out a virtual tour of the fitness center here. Nestled in one of the best neighborhoods in Scottsdale, Camden San Marcos apartments are close to plenty of shopping and entertainment. With Kierland Commons just a few blocks away, spend your time away from home shopping or dining at over 50 restaurants and retail stores. Take in a day of golf at McDowell Mountain Golf Club or check out what’s happening just minutes away at TPC Scottsdale Champions Course. Enjoy festivals and events all year long at WestWorld. There is something for everyone at Camden San Marcos. Minutes from 101 FWY, commuting just got easier and you are only minutes from where you need and want to be. The good life in Arizona is waiting for you. Come home to Scottsdale. Come home to Camden San Marcos. 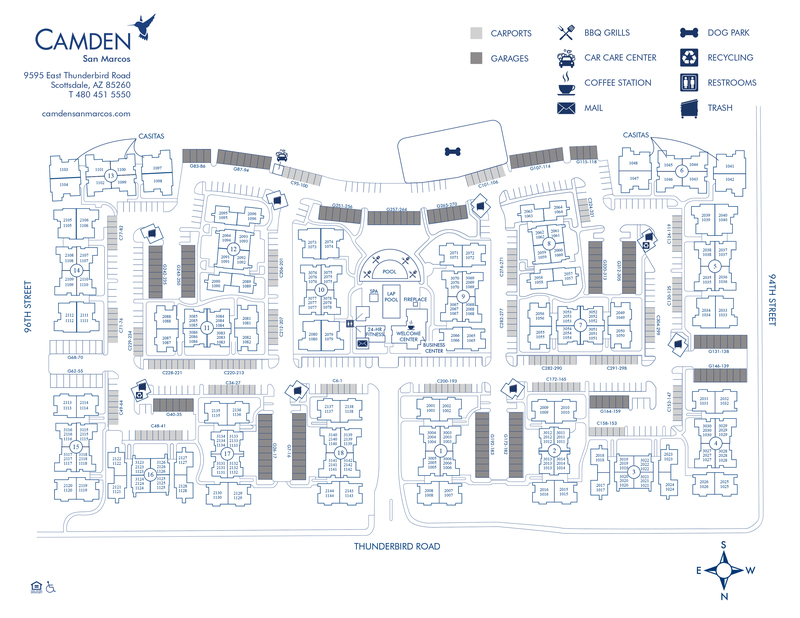 Check out our available floor plans today! We'll save a spot for you! All of our apartment homes include a private detached garage or a carport.